People uses Google’s most popular ‘Google Forms’ to create invite lists and surveys for free. So far its toolset was limited to a pretty basic set of features. To fix this, Google introducing add-ons, extensions made by developer partners which increase the functionality of your forms. You can check out the new features by selecting a newly incorporated “Add-ons” menu in Forms, or get some extra ones through the add-on store. Some of the add-ons being introduced let you set an automatic end date or maximum response number for your forms, for example, or store and load frequently used lists. Right now all the add-ons are free, but one could presume premium extensions will become available for a price; it is a store after all. Developers interested in creating their own add-ons can check out Google’s new guide here. Google has been pushing more functionality into its forms recently, including themes and randomized question orders. 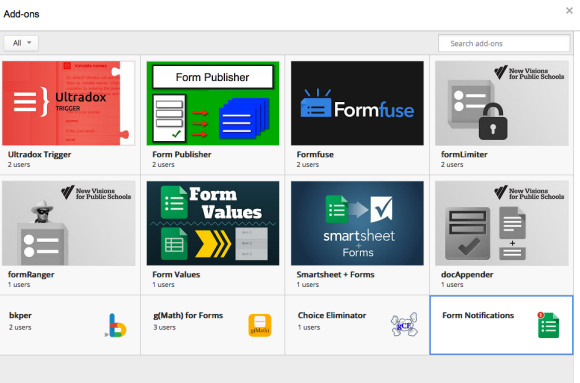 The creation of an add-on store could go a long way towards making Google Forms not just a good free option, but a powerful option as well.